This week Apple appear to set to make their latest consumer product announcement with plenty of speculation all over the web as to what it might be. Personally I couldn't care less as I won't be buying it whatever it is. And before I go on to explain why, I'd like to remind you that this is my own personal opinion and doesn't form the opinions of anyone else, including my employer! The issue I have with Apple is the fanboy mentality that their products have generated amongst a certain niche of the population. This type of person is perfectly summed up by a BBC TV news story when Apple launched the iPhone4 in the UK in June. "I dunno really, I just do"
'Disciple' is not a word I use lightly, as there is an almost Jones-like slavish devotion to buying their products (at whatever the cost) from those who queue for hours (even days, as in one report in the US on the iPad launch), buy every single version of every Apple product as soon as they come out and go on and on and on about how great they are and how everyone should have one. I wouldn't mind if people were buying them on merit as the best product to suit their needs based on having researched the product and found it to be the best in the market. Some do (such as my colleague and friend Nick), but a heck of a lot don't - people want to be seen with the white headphones, so they buy an iPod. They want people to see them with an iPad so they get it out on the train and hold it up in a way where everyone on the carriage can't help but have it thrust down their throat - almost saying "I have a new Apple product, look how great I am". When one version of the iPod first came out I was in the market for an MP3 player so I asked around for some recommendations and tried it out in a shop along with a Creative one and an iRiver. The iRiver had the best sound quality of those in my price range, so I bought that. I don't care what colour the headphones are or how 'cool' I look with it - I'm interested in the storage space, the user interface and the sound quality. 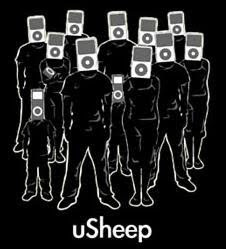 The other thing that annoys me about the sheep mentality is the suggestion (by the sheep themselves) that the Apple way should be applied across everything. "You should design it like an Apple product." People who say that are generally the same, self selecting users who have the company's products coming out of their ears. And that's the point really - they're self selecting. The 84 year old in my local pub wouldn't use an iPod and designing a product for him that works like one isn't going to be of any use whatsoever. While the products they design work well for people they design them for, I doubt they would for those who would never use one - so I do need to think differently. At this point I have a confession to get off my chest. I actually purchased an iPod once as a gift for someone, but did bore them to tears in ensuring that they had done due diligence and were buying it based on its merits rather than its 'cool' factor, so I didn't feel quite so bad. To me it's a triumph of marketing over functionality (as The Telegraph so succinctly put it), but it did the job for them and they were happy. The sheep mentality is not for me and I won't be buying whatever this week's new product is for myself ... I'll stick with doing my own research and choosing my tech on merit rather than marketing. Now no one is going to argue that all normal sensible people want to bash the apple follower with ipod earphones. But I reckon you need to give the stuff a go .. then tell us you still have issues .. My MacBook Pro for two weeks .. deal? I'll pass thanks Anthony. Have used Macs before and don't really like them that much - regardless of my thoughts about sheep! Alex, good thought provoking blog. We're all herding animals at heart. I think it's fine to make a subjective unqualified buying choice and fine also to make an objective qualified choice. We all make the world go round. Ahh now you say you have used macs in the past your blog all of a sudden is credible. Alex - they can't have got everything wrong. Your religious objection to them devalues your argument. The iPad and the iPhone are, without doubt, category leaders. Sheep, or die hard fans? Blizzard will be releasing its latest upgrade for one of the most popular MMORPG games in the world and is boasting 12 million disciples, err, I mean subscribers. 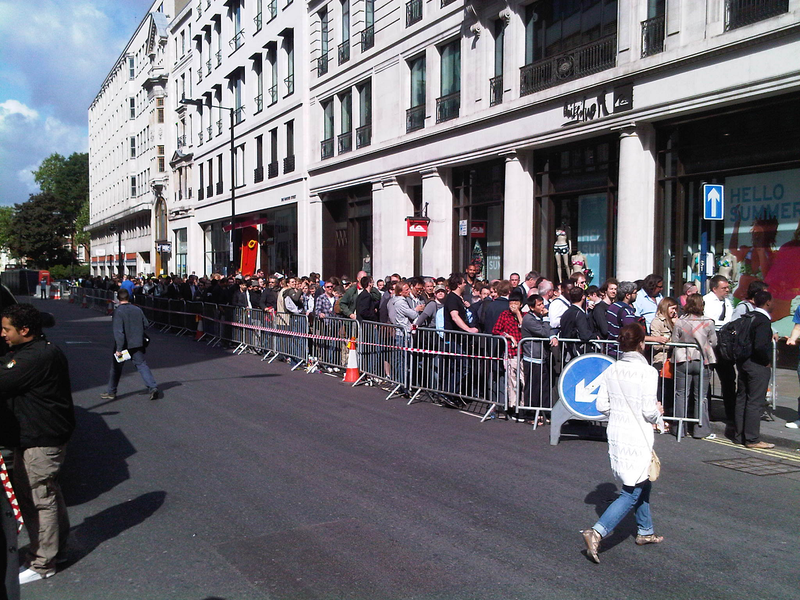 Queue's not to far away from those seen in Apple stores will be seen outside game stores all over the world on the 7th of December for the latest World of Warcraft series. The world is driven by fanatics, even if the product is not all that good. How many Leeds United fans have deserted their beloved club since moving out of the premiership? There will always be die hard supporters of a brand, and like it or not, Apple is a fantastic brand, and despite some fanatical end user comments in the press, Apple make some excellent and innovative pieces of kit. I am of the firm opinion that the smartphone in any form today owes much to Apples foresight. Why, even the top anti virus vendors are having to concede that Apple mean business, or they simply want to catch some of that sweet gravy coming off that train. Symantec, Sophos, Mcaffee and Eset are all producing security products for Apple based systems now. But Alex, their products are so nice and shiny! Regards to sound quality, those white OEM earphones are dreadful. Rather than being a status/ownership symbol, I thought it just signalled someone who couldn't be bothered to get a decent set. That doesn't let off the guy walking over Waterloo Bridge with massive DJ cans plugged into his iPad. Not being a massive Apple proponent, what Apple have got right is the quality and ease of their integration. iPod with iTunes, iTunes with the media store etc. You'd be hard pressed to find another set of consumer devices that work together with that much finesse. Alex, I tend to think you're digging yourself into a bit of a whole with your one-size-fits-all approach to Apple. I did the diligence, I bought a device that more than meets my needs and I've been THOROUGHLY impressed with Apple's staff, their product and their post-purchase support. 2 weeks into my iMac ownership I have to admit it's simply gorgeous, highly intuitive and a lot of fun to work with. In which case Ryan you don't fit into the sheep mentality I'm talking about. Alex, my 4yrs old apple imac is still is solid and fast as the day i bought it, my jailbroken iphone 3gs is still as good to own as the day i hacked it, my home hackintosh is fantastic. Apple's mentality of 'we know better than you' is going to be the downfall of the products. But you have to admit, there design concepts are fabulous, the aluminium cases acting as heat sinks on the laptops, keeping them quiet as no fans exist, therefore increased battery life etc etc. You have to give credit where its due, or do you just prefer nasty Dells? Baah Baah black sheep, can I have is mac book, yes sir yes sir, icore or 5. Apple has done for computing what harmon cardon has done for speakers and audio systems, and after all it took Microsoft seven attempts to get an OS right and yet they still copied OS X's features, just admission that Apple is better functionally and works, is stable and so on. Well im gadget mad and always have my mp3 player on me. i tried the the I-pods and they are good if you need software on your pc/laptop to help you out. Then it started to get a touch on my nerve's when the same software started to to tell me what i can and can not have on my player. its your player not apples,so why can't i put my own music from my own cd's with out i-tunes having a hissy fit. ITS MY MUSIC. and then to be told your nano sport is not ment for cycle riding when it went wrong was the last straw. Well said! However, I would say that your problem here is more with the Apple sheep than with Apple itself. Credit where it's due, Apple only entered the phone market 3 years ago and now it sells the 'phone of choice' (if you believe the die hard fans). I've always been a fan of the Android phones but admit I did buy the iPhone 4. It is really good but there are places where my Blackberry is better. I think my biggest gripe about Apple is the fact they always think they are right. The 'antenna gate' situation with the iPhone 4 is a prime example, they denied it was an issue until they couldn't deny it any more...and then they fobbed off their customers with a free case! Couldn't agree more with you. Despite the fact that Apple products have very slick UI's and look superb, I will NOT buy one of their products as long as they try to tell me what I can and cannot do with it or the content I put on it once I have it. There have also been some glaring shortcomings: for example, any decent hardware engineer could tell you you were asking for trouble designing a case with 2 antennas which could be bridged and shorted out by a finger. Grade A blunder! Neither should it should be necessary to jaibreak a device to be able to use it in the way you want to. That made me laugh endlessly. Reminds me of the old joke about the guy who bought some shoes and then took them back when the soles cracked. The assistant took one look at them and said "But you've been WEARING them, Sir"